Beautiful renovated townhouse in the heart of Lagos town centre boasting great panoramic Sea views! A 4 bedroom townhouse, fully renovated, located right in the centre of Lagos town and at few walking minutes from all amenities and the beach! Spread on three floors, the accommodation hosts a long hallway, 3 double bedrooms, one office converted into the 4th bedroom, a pantry and 2 bathrooms on the ground floor. The first floor is a wide open plan space with a sitting area and a dining area sharing a modern fully fitted kitchenette with integrated appliances and with access to a triangular shape terrace. The second floor hosts a lounge area and another terrace ideal for an "al-fresco" dining boasting open views from the town and the sea. Finally up on the rooftop terrace is where all the panoramic views from Monchique through town, spreading out to Alvor ending on the long Meia Praia Bay and flowing into the sea! The access between all the levels is made by stairs coated with varnished wooden slabs for indoor and decking weather proof for outdoor. The terraces are covered with the same decking wood. 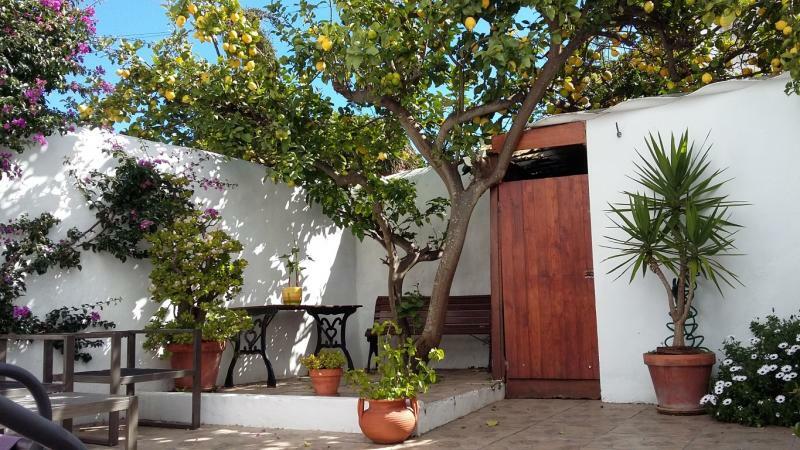 On the ground floor there is a charming private garden enclosed by high walls, a mature lemon tree for shade and a bougainvillea for privacy. At the side there is a locked shed for storage. This property is a gem in the heart of Lagos town centre, perfect for a romantic holiday home or a holiday rental investment!